Keeping the chemicals in your swimming pool balanced is essential to the health and safety of all who enter. Standard levels of chlorine should generally be between two ppm and three ppm (parts per million). Testing it daily will provide you the information you need to calculate the addition of chlorine or the amount of time needed before it is safe to get in. Test kits require a small sample of pool water and display results immediately. Test your pool water often to maintain a clean, clear pool. Obtain a chemical test kit and a water sample collection bottle from your local pool supply store. Most pool supply stores offer water sample collection bottles to collect pool water. Fill and return them to the store anytime you have questions or issues regarding your pool chemical levels for recommendations and advice. Most of them offer this complimentary service year round. Collect water from a deep part of the pool and at a point far away from the filter. The sun will dissipate chlorine, so a shallow fill will not be as accurate as one from as far down as a full arm's length. Pour the sample into the testing container. Add drops to each side of the testing tubes, according to the instructions on your test kit. If you are using test strips, compare the strip to the provided table. Results will display right away. 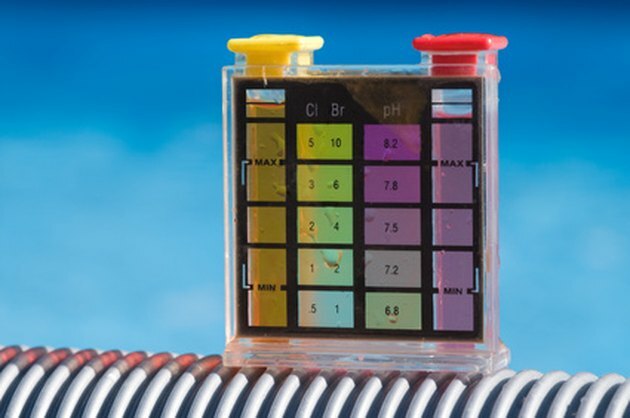 Most test kits offer resulting levels of chlorine, pH, alkalinity, calcium and/or cyanuric acid. Each of these numbers display in ppm. Evette Snowden has been writing Web-based articles since 2008 for eHow and other websites. She has had short articles published in "Regions Bank News" and has worked on career-oriented publications from Regions Bank and LeTourneau University. Snowden holds a bachelor's degree in business management from LeTourneau University.